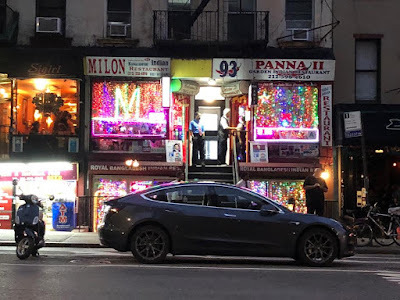 Rachel Pelz files a long read at Thrillist on the growing appeal of Panna II Garden, the parlor-floor Indian restaurant at 93 First Ave. near Sixth Street, in a piece titled "One of NYC’s Worst-Reviewed Restaurants Is Also the Hottest Table in Town." The place has been around for 30-plus years, and is mostly known for BYOB and a room full of twinkling lights that New York magazine once likened to eating inside a Christmas tree ... not to mention its competitive stair greeters battling neighbors Milon, Spice Wala and Royal Bangladesh. However reasonably priced the menu items, the food is wholly mediocre at Panna II, as New York notes. There are so many better places to eat. Still, of late, the lines seems to be getting longer outside. So why are tourists and New Yorkers beating down the door to get into a spot with middling food and coarse service? Because its luminous, rainbow-hued interior looks incredible on Instagram. The decor doesn’t just make up for the food; it justifies its existence. Apparently singer-actress Vanessa Hudgens helped start the Instagram craze with a four-photo post to her 30.4 million followers last December. Soon, Instagram exploded with #pannaii pictures of influencers and wannabe-influencers lit red and gold and green. The hashtag, which now has more than 2,000 posts, is an endless scroll of colorful lights with hardly a samosa in sight. "A lot of people are coming in and taking pictures. In '17, it got popular on Instagram, and it still is today. It’s still famous. You get all these international people who come because of Instagram," says Boshir Khan, Panna II Garden’s 44-year-old current owner. Oh, and how's that food? It's amazing that garish display passed fire codes. seriously horrible food. we went a couple of years ago. Took the kid. the lights are fun. How bad can the food be? I thought. They served supermarket flat pita bread as their nan. I know because I buy that pita at KEY FOOD! Pita as nan. c'mon! Why can't they just make the food decent???!! Before the blandification and authentrification of the EV, I would pass by Panna II and hardly anyone would be there, and the walk was quite nice and peaceful. But now it has become another Instagrammable experience for the Instagram generation. "I’m in it for the lights and the drinks and that’s it.” Don't most of the people go to the EV for that reason? No different than folks lined up to see Kusama's Infinity Mirror at the Zwirner Gallery -- most were not there to appreciate or even know the art but for another chance to Instagram themselves. I went there once in the 1980s and the food was so bad I never went back. Your first clue that something might be wrong here is the two or three guys who were standing outside trying to drag you inside to eat their food. Your second clue is it the place looks more like a ride at Coney Island than an actual Indian restaurant. 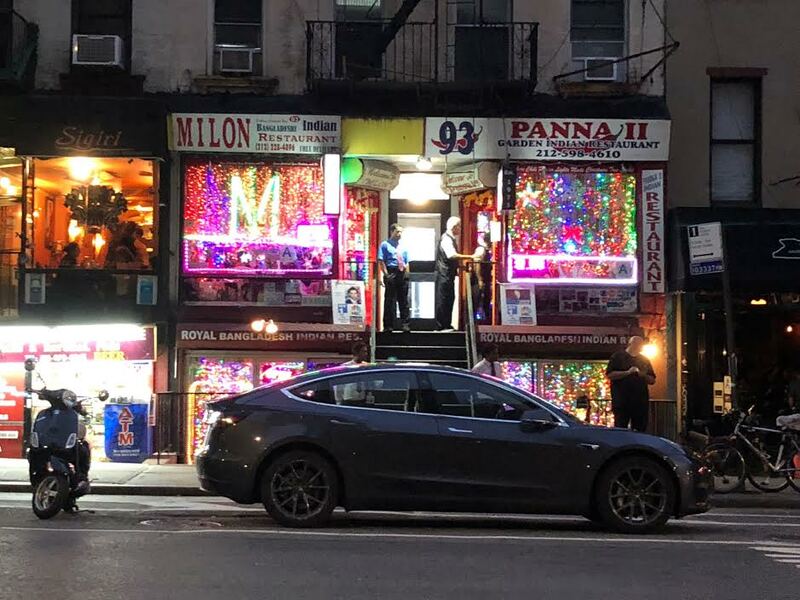 The million Christmas lights are designed to distract you from the fact that the food is really terrible.The irony is that they are located right above an excellent Indian grocery store, so iif they ever actually wanted to cook tasty authentic Indian food, they could. But for some reason they never have. Such is the hyperfied world if the East Village. I went, it was ok. I don't remember the food. The service was goid. The food is gross. I went here a couple years ago for a birthday not even knowing there would be these lights. We went because it was BYOB. I couldn't finish my meal and got pizza after. The restaurant itself felt kind of dirty and was way too crowded. Why are we like this my fellow millennials? Go to a good restaurant and post a pic of food if you need content. This place is just gonna ride the wave of midwesterners-who-move-here-for-2-years-after-college til the health department shuts em down. Infinitely better choices for Indian food on the block. If the twinkling lights distracts the wrong sort of custom from those then fine! I went there once a few years ago; John Leguizamo was there with his young daughter, celebrating her birthday. That's the only thing I remember about the occasion, so apparently the food is eminently forgettable. No one goes to these places for the food, nor do I think they ever have. You go for the lights and the birthday music. As these places have been around a lot longer than most, I wish them well. I was there the night the first Xmas lights went up. Like every other Indian place at the the time Xmas lights were used as cheap low key lighting, so someone at pranna 2 purchased a very large box of used Xmas lights from somewhere and put up every light that was in the box while I ate dinner. It did not seem like a design choice but more to use up all the lights that were in the box. Soon after the excess of lights made the place stand out, and they added even more lights. I used to go there because it was always empty but after the lights went up they were a success continuing to this day some 28 years later. All because of the quantity of Xmas lights in that box. Even if folks now go to the EV for the "noodles, soups, and small restaurants with young chefs that are willing to take a risk", it's still a sad affair since before the Foodiefication of the EV, people came to the EV for the arts, music, culture and counter culture. The major disappointment of why people go wait on line for hours for this "experience" and terrible food is not that they are so narcissistic, but rather that Panna II (and such places) seem to have such a low view of the people who visit them; they try too hard to cultivate happiness and trying to impress your 'friends' on social media with what a fab life you lead is a shallow endeavor at best. Hats off to that restaurant they found a way to survive today's restaurant short shelf life. I went here once 25-30 years ago, yes it was the lights that made me want to check it out. The food at the time seemed no better or worse than the places on 6th street can't speak for it now. Until recently I actually thought millennial dinners must have experienced palettes despite their age, I was a fool, they only went to foodie establishments to blog about it later. Wow that's a lot of income to spend on bragging rights. If anyone new restaurant wants to survive in this neighborhood better get someone famous at a table who is willing to tell their followers that you are a cool if not good place to eat. There's a reason they call them FOLLOWERS. I too was there once, and I remember the food being unmemorable. So that's it! That place had the lights and was empty for decades and now all of a sudden a line. I've been listlessly wondering why for a while now. INSTAGRAM! They need a sitar and tabla for extra that Instagram photo op. Their food was worse than the low end fare around the corner but the Instagram generation has their priorities together. Selfies first! Indian food ended with the closing of Sonali East. Now I just eat Trader Joes frozen stuff. I have love Panna ll for years!! Come on! Even in the 1980s and 1990s, we went there for the lights. Yes, the food is unmemorable, but it sure was (is) a fun place to take an easily dazzled kid, hang out with friends, or charm (or freak out) some out-of-towners. I have very fond memories of washing down sag paneer with a large bottle of rogue ale (for a while, the downstairs store was the only place I could try out some of these daring new craft beers then just hitting the market) with good friends. I would be very sad to see Panna II go the way of so many other little places whose food isn't all that, but whose atmosphere you just can't beat! There's been a line for years. This is not new. Happy for Bashir who we have known since he was a busboy. I used to go there occasionally years back. Food was unremarkable but the X-mas light ambiance made for a fun hang every once in a while. Point being all the other Indian, i.e., Bangladeshi, places were much better. Last time I was there, a few years ago, they served us moldy nan (pita). Haven't been back and have no intention to do so. Panna II has become just like Rolf's, people go there for the Christmas lights and not the food, except and at least Rolf's take down their Christmas decorations after the Holidays. "WHAT riles Olid Ahmed the most are the barkers. On any given night the young men, nattily dressed in double-breasted suits, work the sidewalks in front of East Sixth Street's two dozen Indian restaurants, tempting passers-by with half-priced biryanis, free mango ice cream and unlimited cups of spiced tea. 'The way they are calling at people brings disgrace to us all,'' Mr. Ahmed said one evening last week, ...' "
"'In the 1980's, there would be limos and so many cars from Connecticut and New Jersey,' he said. 'Where they have gone, I do not know.'" Not surprisingly, East Sixth Street did not welcome the Bangladeshi invasion. "'What had been a very tranquil street suddenly became very noisy and dirty,'' said Soretta Rodack, who lives at 310 East Sixth Street. ''At night, you couldn't even walk on the sidewalk it was so crowded and in the morning, the street would be strewn with chicken parts.' "
"I asked Mubdi about the oddity of "Indian Row" being mostly free of Indian people, and he laughed again. “We had to call the restaurants Indian, because nobody knew what Bangladesh was! We named ours Gandhi, because people knew Gandhi from the movies. Our next place was called Passage to India. That was another movie!" @9:40 AM. Panna is the Indian Rolfs! LOL That is so true. I had one of the worst meals ever at Rolfs, but much like Panna. people don’t go there for the taste-free German food, they go for the crazy Christmas decorations and lights. And while itls true that Rolf’s used to take the lights and decorations down after the holidays, now they seem to just switch over to a different set of lights and fewer decorations for the balance of the year, but its still overdecorated for the Instgrammers. Was this place once called Rupali? Maybe next door? Apparently it was once also called Milon ... or maybe that too was next door. I remember going in the early 2000s and possibly earlier, the food was OK. I went with someone who lived on E 6th St. who recommended it because they had vegetarian options (perhaps only vegetarian options). One thing I remember, aside from the interesting lights, was everything was always half price! I was once told that the food was not really Indian but Bangladeshi, probably like most of the other former offerings on E. 6th.